Chemistry is something I have not experienced in real life yet. A good vibe, yes. Instant attraction, definitely. Overwhelming lust, for sure. But the kind of chemistry between fictional characters Atticus Kelly and Hazel Stone is something I have only read about in books. It literally took a second for these two to connect, making it impossible to resist each other. Their chemistry burned too fast like a candle down to the wick. The result is something no one—not readers or the characters themselves—could have predicted. I downloaded The True Story of Atticus and Hazel eBook on a whim. It was recommended on my Kindle app, cost less than $3 and had an eye-catching colorful sketched cover. Never having heard of the author before, I did not know what to expect. None of my Goodreads friends had it listed so I could not rely on their opinions. There were less than thirty reviews to go by since it was published only a week prior. I watched the book trailer below that still didn't give any info. The plot description was vague but Kindle/NOOK recommendations very rarely steer me wrong. My goodness am I so very glad that I clicked BUY NOW. The characters were fully fleshed out. Hazel is a 20-year-old artist and Atticus is a 26-year-old music producer with a family of happily married parents and handsomer-than-handsome brothers. These two meet by chance at a bar like most characters in contemporary/new adult genre. But a sudden shift happens in the book that forced me to postpone plans for the day until I finished...with smiles then full-on tears! 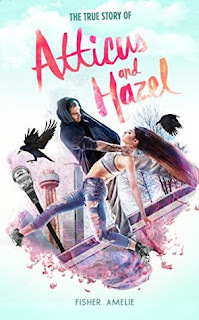 I cannot explain why I was led to read The True Story of Atticus and Hazel or why I connected the way I did; however, I recommend my bookhearts read this emotional story that was clearly written from the author's heart. Thanks for the art at the very end of the book also, Fisher Amelie. It gave this story a perfect bittersweet ending.